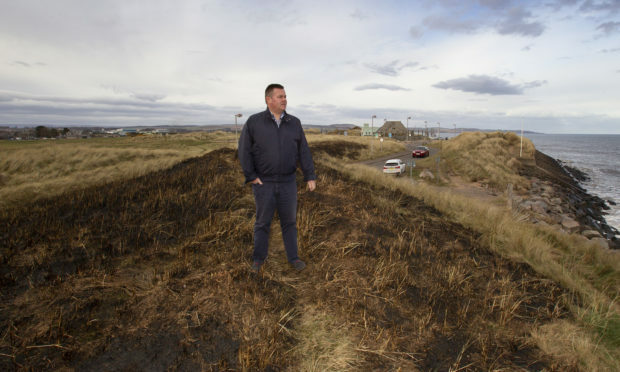 Mark Salmond at the grass area burnt along the seafront at Montrose. A spate of weekend fire-raising incidents at opposite ends of Angus has sparked fears of an upturn in incidents as the school holidays loom for bored youngsters. The trouble hotspot of the derelict Strathmartine Hospital was targeted in what police say was a deliberate incident on Sunday evening – just days after fire chiefs had highlighted progress in tackling long-running issues at the site. Around the same time, Montrose firefighters were dealing with the second blaze in as many nights to take hold of grassland at the town’s seafront. No-one was injured in the incidents and the fires were quickly dealt with, but community leaders fear the arrival of the school holidays in a fortnight may trigger a surge in attacks. The Montrose blazes hit the grassy dunes beside the road leading around the seafront. Independent councillor Mark Salmond said: “It’s always difficult to say it was kids for certain, but two fires on consecutive nights in the same area is a concern. “Wilful fire-raising is not an issue that we have had crop up in our regular monthly reports from police, and I am sure they will be giving this area more attention now we have had these incidents. “But with the lighter nights coming in, the school holidays approaching and kids out playing I would like to see this nipped in the bud as soon as possible,” said Mr Salmond. “We’ve a caravan site there and the risk of cinders being carried could lead to disaster,” he added. Police Scotland are pursuing what they said was a positive line of inquiry into the Strathmartine blaze, warning it could have had dire consequences. “They have put lives at risk, most obviously their own,” said a police spokesperson. “We would still like to speak with anyone who has relevant information that could assist our investigation. “This is one of a number of empty and derelict buildings in and around Dundee, many of which are hazardous environments. “People place themselves at risk if they enter these buildings, especially if they are reckless enough to start fires. Monifieth and Sidlaws SNP councillor Beth Whiteside said: “Luckily, this was brought under control quickly, but the longer the property sits empty, the more it is deteriorating.